Villas in Crete - specially chosen for family groups are shown below from west to east. 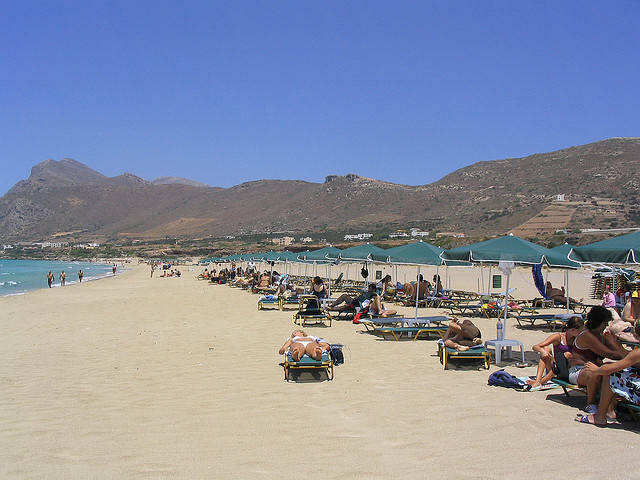 Villas in Crete - within comfortable driving distance to Elafonisi Beach, in the south-west of Crete, are Mouri Villas. This settlement consists of a renovated 1 bedroom house from the 18th Century and a 3 bedroom modern home in traditional style. This is perfect for a large family group, accommodating 8 people in 4 bedrooms and 3 bathrooms, with a pool and jacuzzi. Find lots of outdoor space for eating meals together in the shady courtyards, by the pool with views over green hills. Enjoy the elevation and expansiveness of being up high and taking in the fresh country air. Enjoy the stone and wood traditional architecture with modern conveniences. Just 43 km from Chania town and 8 km to the nearest beach. 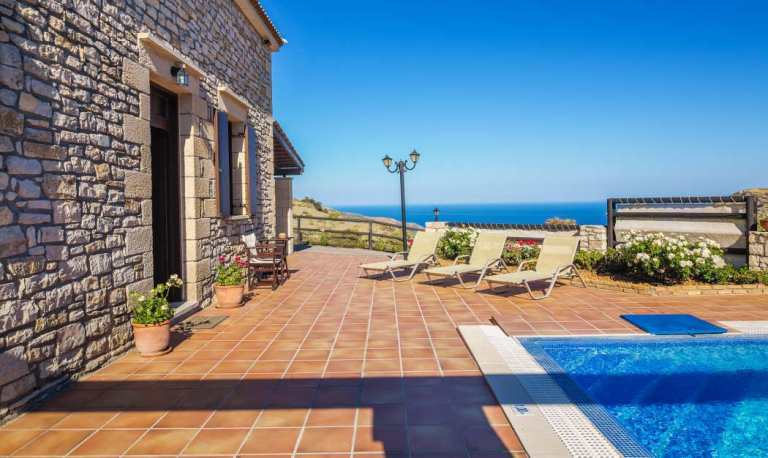 Villas in Crete - sitting 6 km inland from Falasarna Beach and slightly elevated, these two villas can accommodate a large family gathering, with up to 16 people in 2 villas with 3 bedrooms and 3 bathrooms each. 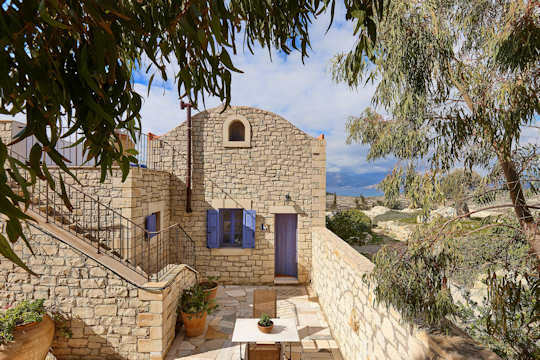 Located near the small town of Kissamos and the capital of this region, the picturesque Venetian town of Chania, these villas allow for relaxed private time, whilst providing a great location for beach exploration, cultural tours and mountain walks. Platanos Villas are newly built in the traditional island style, meaning lots of wide open spaces of stone and wood, chunky rustic wooden beams, open fireplaces and plenty of room for family meals dotted about the place. Enjoy the cool flagstones and air conditioning or laze by the pool. The villas are near to several local tavernas with fresh seafood. 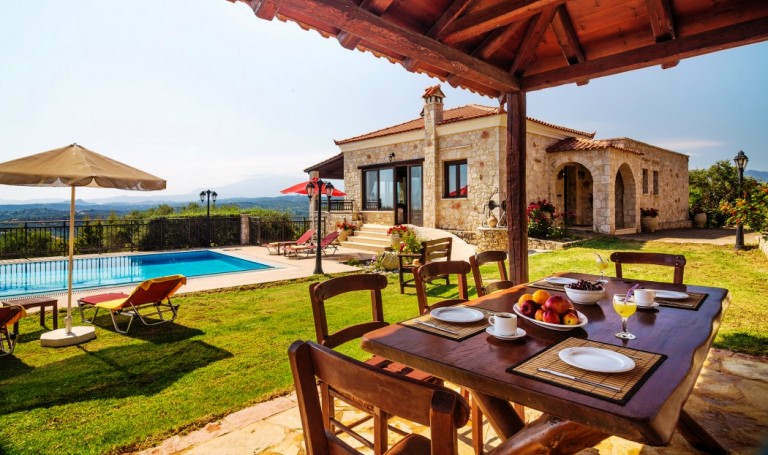 Villas in Crete - create some harmony in the family in this beautiful villa in the countryside near Polemarchi in Chania. This 4 bedroom villa sleeps 10 guests with 5 bathrooms and loads of outdoor space, including a pizza oven, pool and children's pool. Built in the traditional country style of the region, it is spendidly designed in stone and wood. Close to the beaches of Chania's northern coast, visit Kolymbari, Maleme and Agia Marina beaches, or a little further visit Balos Lagoon and Falasarna Beach. The town of Chania is 30 km and the airport only 39 km. In the small village of Tavronitis you will find a butcher, baker and patisserie, and local markets with fresh produce are held in Voukoulies village nearby. Close by at Ano Vouves are some of the largest known olive trees and an Olive Museum. 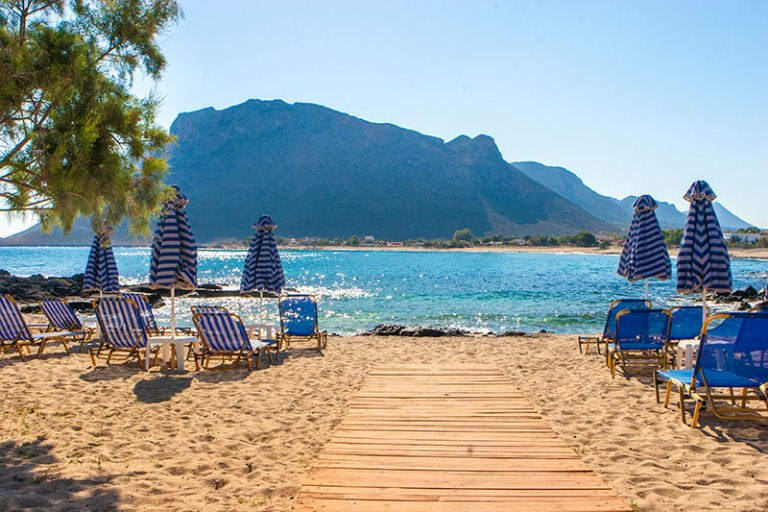 Villas in Crete - Stavros Beach (pictured above) is a stunning landscape with a sandy beach only 15 km from Chania town in the west of Crete. 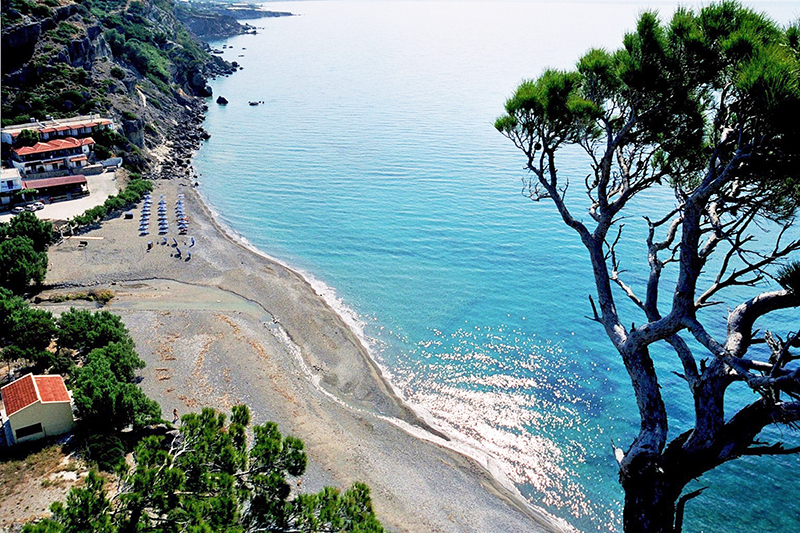 This beach was the wild location for the filming of the dance of Zorba the Greek. Within minutes of the international airport and Chania's ferry port at Souda Bay, this villa makes a wonderful easy location for your family reunion. This villa accommodates 12 people with 6 rooms and 4 bathrooms. Laze away your days by the sea and pool, soaking in the colours blue, blue and blue. 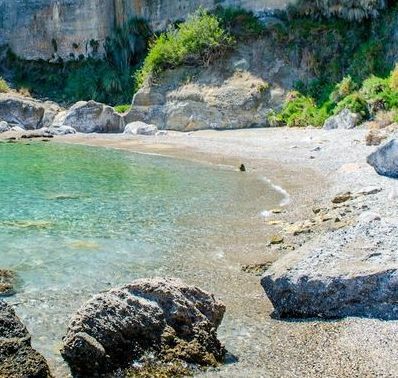 Visit the little cove of Tersanas Beach, find plenty of tavernas and cafes at Stavros Beach and in Chania town. 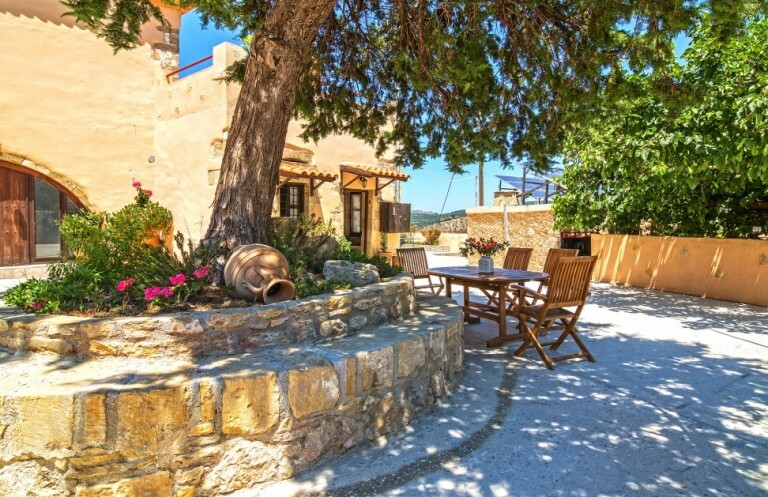 Villas in Crete - in the peaceful village of Stavromenos is this traditional village-style cluster of homes making an impressive villa with accommodation for 12 guests in 4 bedrooms and with 7 bathrooms. Located 25 km from Rethymnon town with its characteristic Venetian Old Town and Old Harbour with seafood restaurants and seaside cafes, there is plenty to explore all around the Rethymnon region, including many fine beaches. Visit the nearby village of Margarites and the historic Arkadi Monastery. These lovely village homes date from the beginning of the 19th Century and have been lovingly restored and modernised to cater for your family's holiday comforts. Relax in one of the many courtyards or by the pool, or around the outdoor ovens. 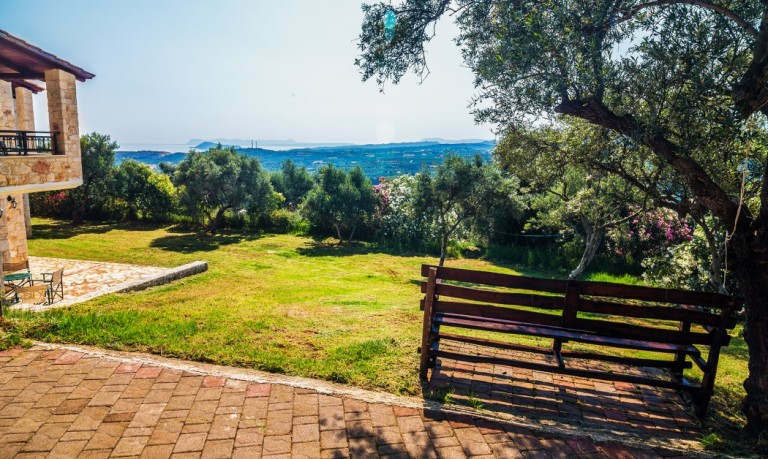 Enjoy the peace and quiet of a rural setting, surrounded by olive groves. 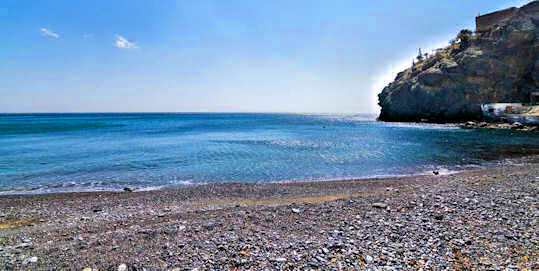 Matala Beach is located on the south coast of Heraklion 75 km from the capital Heraklion town and just 71 km from the international airport. This unique sandy beach has plenty of atmosphere, scenery and history, as well as clear, clear waters and loads of water activities. Known for its caves which date back to ancient times, it also has a very distinct and beautiful peninsula jutting into the bay. The calm waters are perfect for swimmers and snorkellers of all ages. Scuba diving and boat trips are available and the tight cove is ringed by tavernas and cafes. 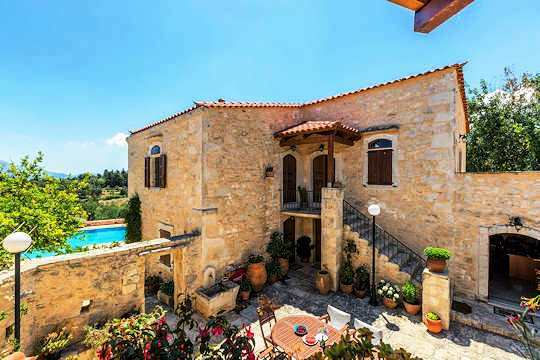 Villas in Crete - Orelia Villa is just outside the village of Kamilari overlooking the Libyan Sea. With adjacent villas and apartments you can accommodate your extended family with various combinations, with the friendly help of Voula and her family. 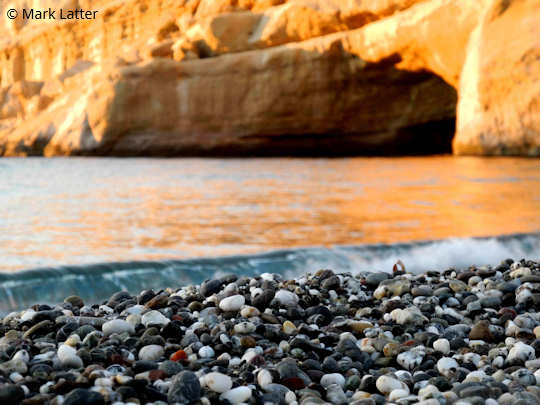 Explore the Heraklion region; visit Matala, Kommos, Kokkinos Pirgos and Red Beaches nearby. This villa is also close to the ancient sites of Phaistos, Gortyna and Agia Triada. The Thalori Retreat is set is the village of Kapetaniana in the Asterousia Mountains of southern Heraklion. The village is 64 km from Heraklion town and from the international airport. This stunning high mountain location is a unique and traditional choice for your event or seminar, or indeed a large extended family gathering. Of course, relaxing away from everywhere in Crete, still means exquisite hospitality and friendliness, and wonderful food! 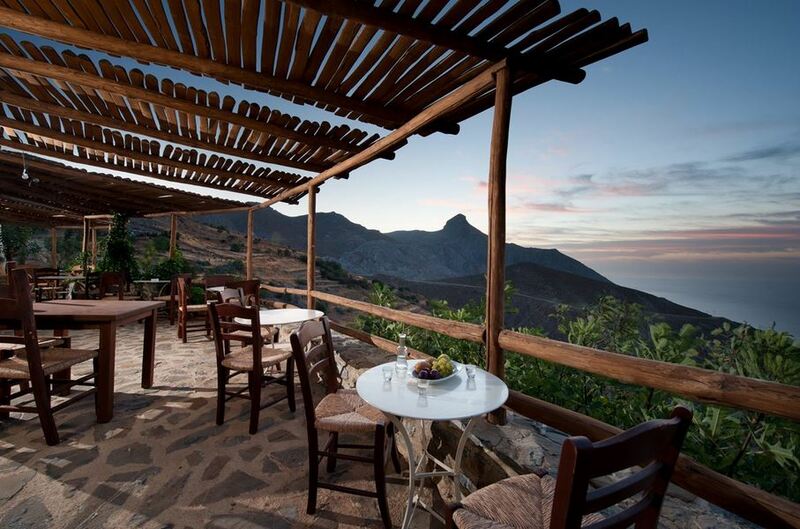 The beauty of choosing this retreat is that the taverna operates all year round, providing the quintessential local cuisine in time-honoured tasty volumes, and plenty of atmosphere and conviviality to compliment the meal and complete the mood. 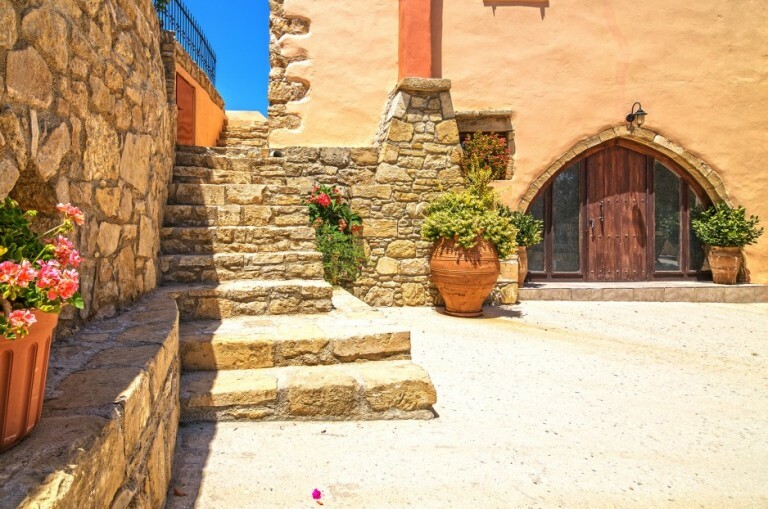 Villas in Crete- the House of Turquoise is located in the remote seaside village of Tris Ekklisies, meaning Three Churches, on the south coast of Heraklion in Central Crete. This special, remote fishing village is found at the base of the Asterousia Mountains after a steep, winding drive down the dramatic, treeless hills. 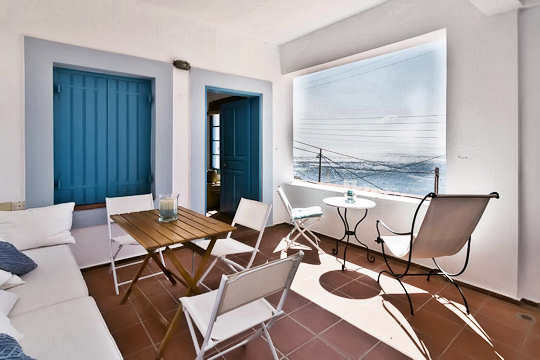 This typical Greek home sleeps 8 guests in 4 bedrooms and 2 bathrooms with kitchen and many areas to relax, after visits to the beach just 1 minute's walk away, with a welcome by the owners and plenty of tips about what to enjoy in the village. This is a simple village home that has been renovated to modern standards with a stunning blue and white theme, echoing the deep blue and sparkles of the incandescent, bright sea. Enjoy the panoramic seaside views, the mountain backdrop behind the village, the remote location and clear waters. There are tavernas in the small village, and untouched beaches a little further walking down the coast. The beaches are of grey sand and pebbles. 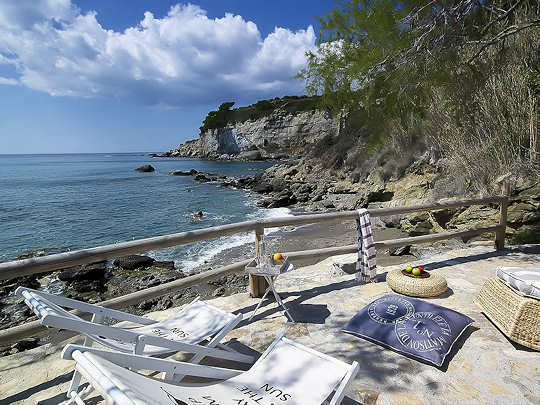 Explore the wild and untouched coastline and mountains, visit Keratokambos Beach and Matala Beach, find seafood tavernas and quiet beaches, or go snorkelling and scuba diving. 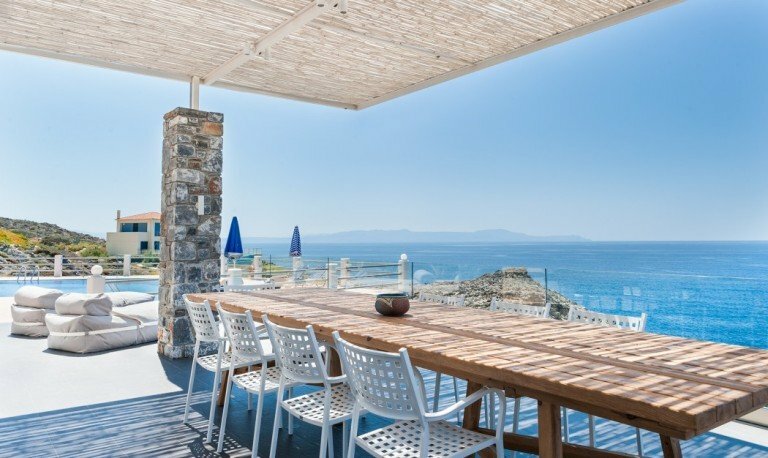 Villas in Crete - these exquisite villas will be your family reunion solution. Combine 1, 2 or 3 villas together to fit everybody close, yet with 'sanity' space between each home. 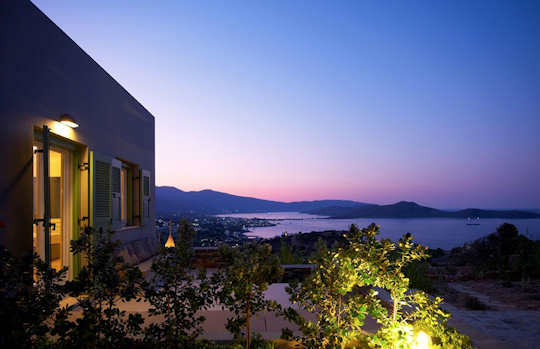 Elounda Villa sleeps 10, whilst the other two Almond Tree Villas sleep 6 and 4 respectively. Various combinations of bedrooms and bathrooms are available and all have access to a pool and gardens, excellent quality of amenities including BBQ areas, patios, terraces, kitchens, air-conditioning and sun lounges. 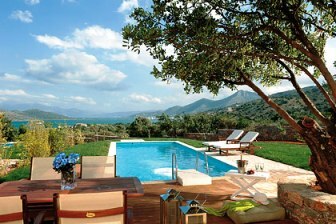 These villas are best accessed with a vehicle as the nearest beach is 20 minutes away, at Elounda Beach. Explore the Lasithi region from this location. Villas in Crete - this contemporary styled villa sits high on the hill overlooking the stunningly beautiful bay of Elounda, and features 8 bedrooms with 8 bathrooms welcoming 16 guests easily, in luxury. Allow your guests to relax under one roof, whilst being perfectly situated to explore the island or attend your special event. 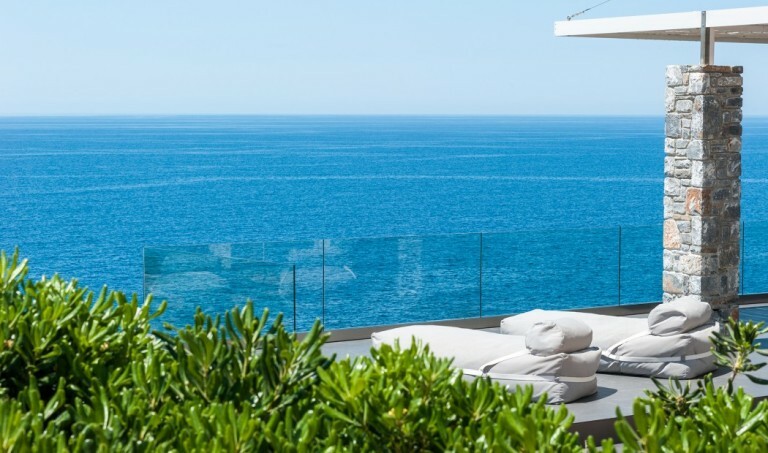 The terraced design gives many opportunities to take in the magnificent view, as does the infinity pool. 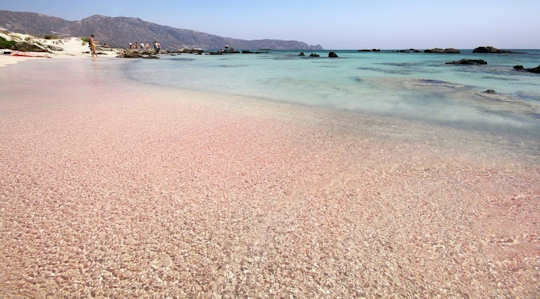 Stay minutes from Elounda Village and Elounda Beach and 10 km from the vibrant town of Agios Nikolaos in eastern Crete. 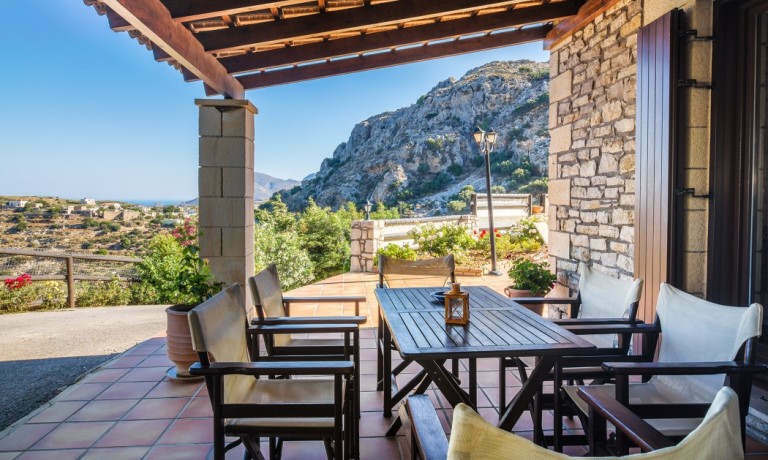 With 6 bedrooms in the main villa and 2 independently accessed guesthouses, there is plenty of privacy and roominess in this spacious, modern, stylish villa near one of the most cosmopolitan holiday villages on Crete. 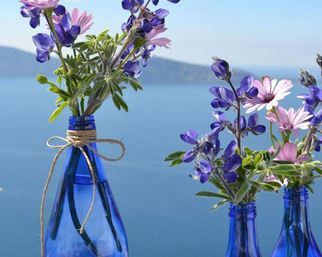 Villas in Crete - your special ceremony, event or wedding can be held at this special property near Elounda in eastern Crete. 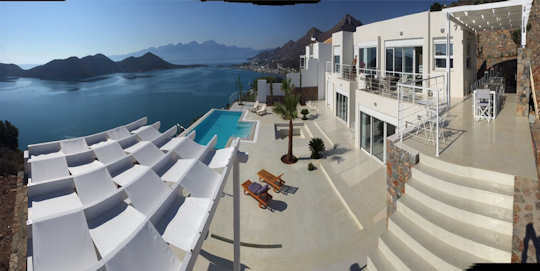 With spacious villas combining to sleep 26 guests in 12 bedrooms and 11 bathrooms, the needs of your party will be met. Event arrangements can be organised by attentive local staff. Take advantage of the many terraces and patios on the premises with extraordinary views over the twinkling Elounda Bay, for your ceremony in situ. You might like to use the crisp white amphitheatre that seats up to 50 people. Now that is different! A recent guest said "The property is well-planned, beautifully landscaped and has gorgeous, breathtaking views!" These astonishing villas are located 10 km from the town of Agios Nikolaos in eastern Crete, just 68 km from Heraklion International Airport. 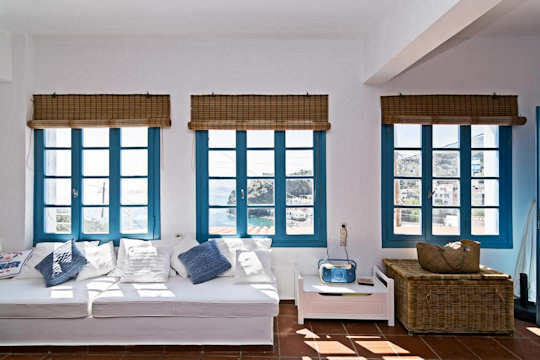 Explore the Lasithi region with these villas as home base, if you can drag yourself away from the pool. 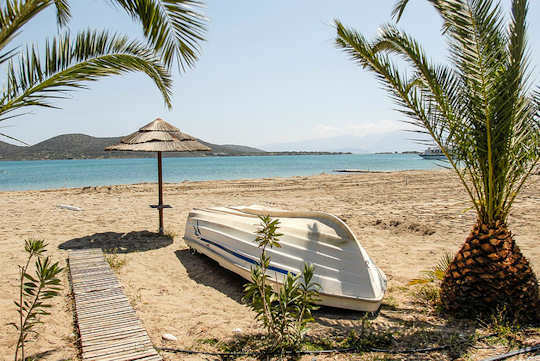 Villas in Crete - what could be better than your own private beach with a large property and two villas? Each villa has its own privacy, and there are plenty of outdoor areas to gather for meals and parties, or stroll down for picnics at the three cove beaches with clear waters. Located just outside Makrigialos in south-eastern Crete, these villas are a unique find, set amongst tranquil gardens overlooking the sea. Carob Villa accommodates 8 guests in 3 bedrooms with four bathrooms, whilst on the same property, Villa Kali Skia welcomes 6 guests in 2 bedrooms and 2 bathrooms. Idyllic waterfront living with privacy and luscious gardens, these two villas rented together will accommodate 14 guests.